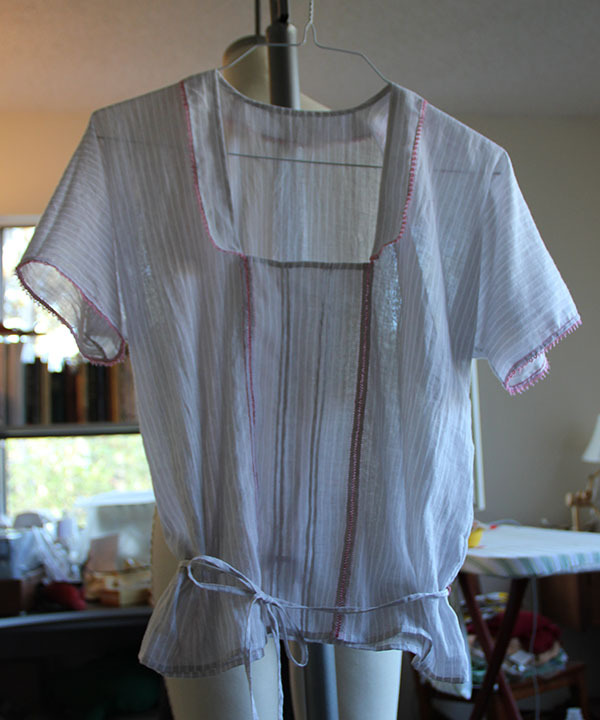 Armistice blouse number two has much more in common with its early 20th-century inspiration style than my first attempt. It’s completely hand finished — I used the machine only for the side seams (they are finished by hand with a faux French seam), attaching the collar, pintucking the front panel, and sewing the waist cord. 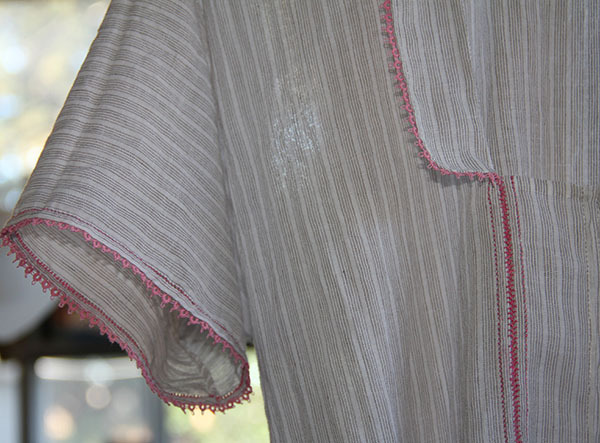 The fabric is a nearly-sheer, thread-dyed cotton gauze pinstripe that I picked up on the clearance rack at Walmart, of all places. I also reverted to the utilitarian waist tie — on period examples I’ve seen, this tie is usually made from narrow twill tape, never meant to be seen. 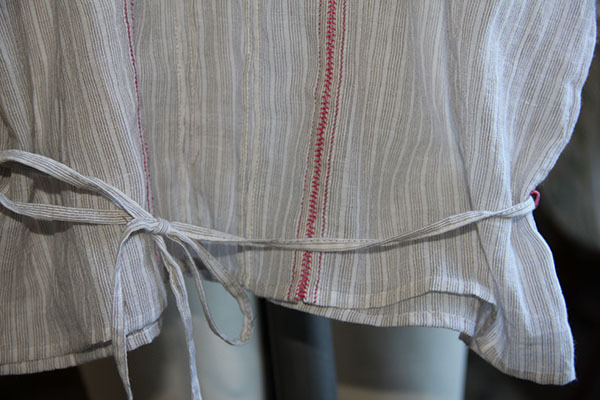 It contained the blouse’s fullness so it could be neatly tucked into a fitted skirt. Since I don’t intend to wear this blouse (at least not exclusively) with late-Edwardian skirts, I compromised with a self-fabric tie, top-stitched over a double pleat at center back, and held in place with thread loops at the side seams. For modern ease of wearing, not to mention my legendary hatred of buttonholes, I decided to make this an over-the-head style. Version three is already underway. I’m going to adjust the fit a little under the arms, and add pintucking over the shoulders as well, in an attempt to contain some of the bagginess around the bust. And I need to figure out the whole collar thing too. I’m also thinking about doing a little tatted motif to set into the front panel. We’ll see how ambitious I get.